It´s always hard to find really cool, stylish and extraordinary tunnel jewelry. That´s why we update our huge flesh tunnel portfolio on a regular basis. If you love tunnels and plugs that will really stand out, our form plugs might be the best choice for you. These are available in many different materials like various stylish kinds of wood, stone, acrylic and steel and many others. To give you some input which form flesh tunnels might be your cup of tea we would like to make some suggestions. Show some love to the world. Even if it is cold and dark. :-) With your heart ear tunnels you will definitely send a positive message to the world and like in many other cases almost for sure you will get some positive energy back. No matter if you prefer tunnels or flesh plugs heart shaped piercing jewelry is available in many different variations. Our most popular love tunnels are the acrylic ones in red and pink of course. Many piercing fans also order red ear plugs made from jade stone or pink ones out of rose quartz. 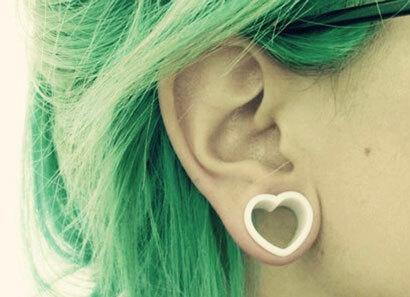 At least as popular are the white and black flesh tunnels in the shape of a heart. These are also available made from acrylic, steel and stone. If you like thinks a bit more edgy our quare plugs might be the right choice for you. These are very popular at the moment but because of the many variations we offer in our shop you can still stand out with your individual square shaped tunnel jewelry. The most beloved ones are the black square plugs made from ebony wood, the beautiful yellow / light brown ones made from jackfruit wood and tiger textured sqaure ear plugs made from palm wood. If you prefer a different material you can also find flesh plugs made of bone, organic buffalo horn or aventurine stone here. The good news is: Even if you have widely stretched earlobe piercings our square ear plugs will be a good choice for you because most of our square tunnels are available in sizes up to 30 millimeters.